3 February 2015, at 9:55a.m. 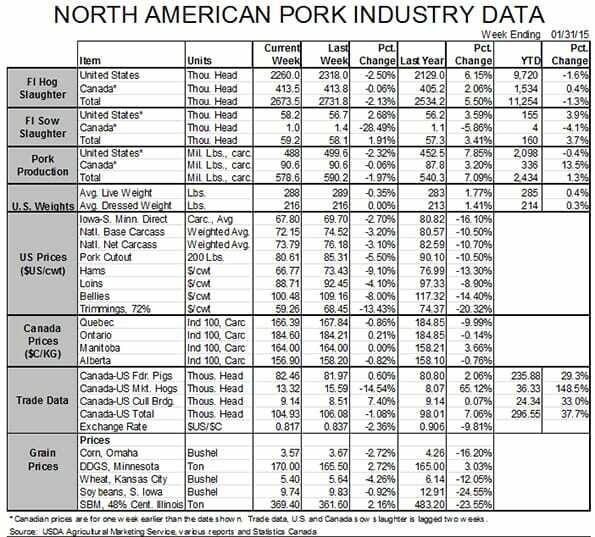 US - A major contributor to strong pork demand has been the prices of competing meats over the past couple of years, writes Steve Meyer, in the National Hog Farmer. Major reductions in turkey supply, a very slow response to lower feed costs by the broiler industry and the aftermath of the droughts of 2011 and 2012 in the beef industry have all been helpful to pork demand. When the prices of competing products rise, consumers substitute pork and push the demand higher. Higher demand and the supply restrictions caused by porcine epidemic diarrhea virus resulted in record pork and hog prices in 2015. But those relationships are beginning to move the other direction. Some will move quickly and some will move slower, but they all point to at least a slowing of the breakneck pace we have seen for pork demand growth the past two years. Whether pork demand holds its own or declines, will depend on consumers’ income levels and “tastes and preferences” for pork. The first of those is still improving slowly as evidenced by quarter-to-quarter gross domestic product growth of 2.6 per cent in the fourth quarter of 2014. How the latter might change is largely unknown but low-carb, high-protein diets still appear to be in favor. Friday brought a new view of how the supply situation for beef is changing as the US Department of Agriculture released its semi-annual Cattle (or, as it is usually called, Cattle Inventory) report. And the news was bearish – for everyone. 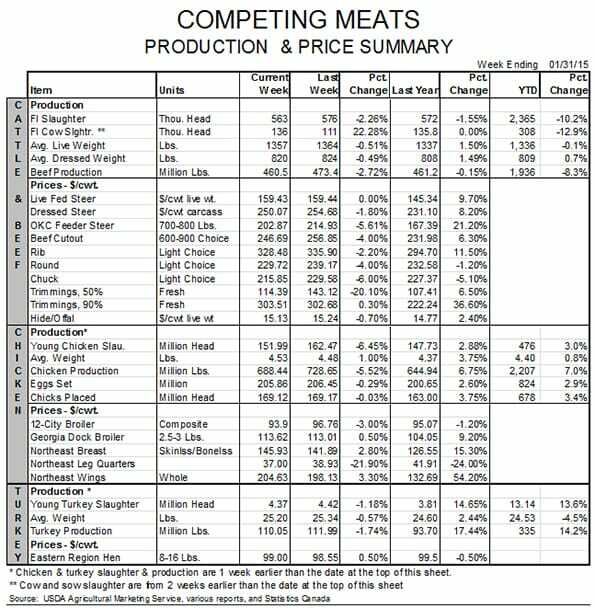 The USDA’s estimates for the various classes of cattle and production variables were almost all larger than their respective average pre-report estimates. I should note that I thought those estimates looked almost ridiculously low to begin with but they are what the trade looked at going into the report so they are the benchmarks – at least for now. The key national data appear in Exhibit 1. The beef cow inventory was up 607,000 head from last year at 29.693 million. That is a 2.1 per cent increase. It is the largest number of beef cows since Jan. 1, 2012, but is still more than 1.2 million head lower than on Jan. 1, 2011 before the Texas-Oklahoma drought of 2011 forced the herds of those two states to be drastically reduced. Interestingly, the combined Texas and Oklahoma beef cow herds declined by 1.246 million from Jan 1, 2011, to Jan 1, 2014. They gained 475,000 this past year. Beef heifer retention was up sharply, gaining 271,000 or 4.1 per cent on the level of one year ago. This is a testament to high cow-calf profit expectations and much better pasture conditions. It also reduces current beef supplies sharply as those retained heifers are not available for slaughter. That was an important factor for 2014 supplies but what about 2015? We expect retention to remain aggressive as long as grass conditions are good. The 2014 calf crop was estimated to be 33.9 million head, 0.5 per cent larger than the revised 2013 figure which was about 0.6 per cent lower than the original estimate made last year in this same report. That is an increase of only 170,000 calves for 2015, hardly the beginning of a flood of product, but wait for 2015! If the cows and retained heifers in this report calve at rates commensurate with the past two years (i.e. about 70 per cent ), the 2015 crop will be roughly 34.57 million head, nearly 2 per cent larger than that of 2014. 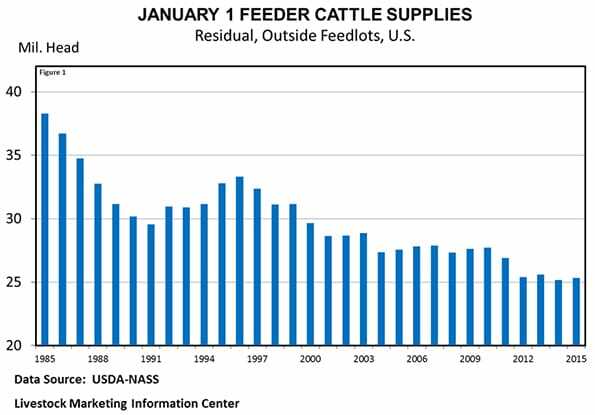 Finally, the numbers indicate that feeder cattle supplies are finally growing again. See Figure 1. This is a computed number using lightweight calves and the steers, heifers and bulls, headed for the beef supply chain. The 25.313 million head available outside of feedlots on Jan. 1 was 0.5 per cent larger than last year. That increase is smaller than the one witnessed in 2013 when calf supplies rebounded a bit before heifer retention really got rolling. Chicago Mercantile Exchange Live Cattle and Feeder Cattle futures, quite predictably, reacted negatively to the report with FC futures falling by their $4.50/cwt. limit today and LC futures declining by $1.58 to $2.78 as of 2:30 p.m. The real impacts for fed cattle and beef prices will not likely be seen until 2016, but the positive influence of beef on the pork complex may be coming to an end, or at least waning. Bottom line: Economics works again! An interesting by-line will be the relative size of beef and pork production in 2015. It is very likely that pork production will be larger than beef production for the first time since 1959. Domestic beef consumption will still be larger since our net exports of beef are near zero while our net exports of pork amount to about 17 per cent of output.